Scientific peer-reviewed journal founded in 2015. Authorized by Federal Service for Supervision in the Sphere of Telecom, Information Technologies and Mass Communications, license ПИ № ФС 77-61465, April 10, 2015. Frequency —3 issues per year. Distribution — Russia and abroad. 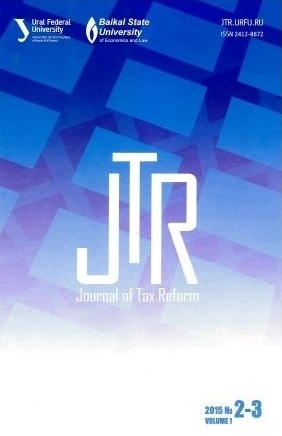 The primary objective (mission) of the Journal of Tax Reform is to improve the quality and credibility the scientific research in the field of tax reform; to promote comprehensive study of socio-economic and other consequences of tax reform and effects of various tax transformations. The Journal covers in its issues papers and other materials related to administrative, managerial and economic problems of tax reform, highlights questions regarding historical experience of tax reform and tax evasion counteraction.